However, Zemeckis seemed to have lost his fastball as of late. Between his prior two films, Flight and The Walk, Zemeckis struggled to make a straight forward mainstream drama. In fact, since 2000's Cast Away, Zemeckis hadn't made a decent film. The man was always known for pushing the barriers of visual effects, even Forrest Gump won a deserved Oscar for Best Visual Effects in 1995, but Zemeckis seemed to rely too heavily on it during the second half of his career. Films like The Polar Express and Beowulf may have some things that are visually stunning to behold, but have stories that are so weak that even James Cameron was laughing at Zemeckis. Robert Zemeckis tried to do a slight pivot by added key VFX touches in straight-forward films a la Forrest Gump with films like Flight and The Walk, but again, weak stories with non-compelling characters made the filmmaker seem like a relic. A man who USED to be good. But like a shot of adrenaline, Robert Zemeckis comes roaring back and proves to us that his fastball is back. He may have lost a few miles off of it, but it still gets batters swinging and missing. While the selling point of Allied is that Brad Pitt's Max Vatan must determine if his wife Marianne Beausejour, played by Cotillard, is an enemy spy, surprisingly, that's a plot point that doesn't exist until the beginning of the second act. The first act of the movie is Vatan and Beausejour on a mission in Nazi controlled Casablanca basically just getting to know each other. Zemeckis lets Brad Pitt be Brad Pitt and Queen Marion be the Oscar-winning actress she is. The two have incredible chemistry and they help build up the relationship in order to get it tested throughout the rest of the film. 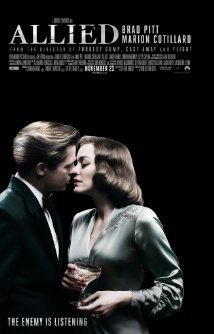 There are some gorgeous visuals in Allied thanks to Zemeckis' eye, the set design while the two stars are in Casablanca makes it feel like you're back in the film of the same name and Cotillard's character gives birth in an open square during a Blitz in war-torn England that's stunning, but it's the tension that builds in particular scenes that is the real winner. Like the visuals, the tension comes in, flashes its brilliance, and leaves lurking in the background waiting to rear its ugly mug again. The film is not a pure thriller where the tension builds and builds until it eventually hits its breaking point, but exists long enough to throw a monkey wrench in between Max and Marianne. At its core, Allied is a love story but it's cleverly disguised as a period spy drama. The purpose of Allied is not to find out if Marianne Beausejour is actually an enemy spy or not but to take us on an enjoyable roller coaster ride while Vatan is testing her. Ultimately, you don't *really* care if she's a spy, not in the traditional whodunnit sense, but what impact that she might be a spy has on the two's relationship with each other. Ultimately, I really enjoyed Allied. It never felt boring and Pitt and Cotillard carried the movie beautifully. It's probably not the perfect film to see in the theater if you don't go to it regularly, but it is worth the watch. I'm also glad to have good Robert Zemeckis back in my life.